Clean the asparagus and trim any white ends or peel with a vegetable peeler. Bring a large pan of salted water to the boil, drop in the asparagus and blanch for 1-3 minutes until just tender. Drain and immerse in very cold water to prevent further cooking. This leaves the asparagus bright green. Mix the lemon juice and olive oil together with the sea salt and black pepper. Add the cooked boiled potatoes, cherry tomatoes, olives, shallots and basil and toss together. Arrange the asparagus on a large platter or individual serving plates, spoon some of the potato mixture over the asparagus and garnish with the crumbled cheese. Melt the butter with the oil in a heavy based frying pan over a medium heat. Add the shallots and cook for 2 minutes until starting to soften, taking care not to brown them. Add the diced chicken, and fry with the shallots until the meat is sealed but not browned. Add the garlic and fry for a further minute. Pour in the white wine and stock, bring to simmering point and cook gently for 5 minutes. Add the asparagus and cook for 3 minutes, then add the frozen peas and cook for a further 2 minutes. Add the crème fraiche and stir through well. Sprinkle with the chopped tarragon, season and serve with some plain boiled new potatoes or rice. Gently fry the onion in the butter until it becomes translucent. Add the rice and cook for a couple of minutes on a medium heat, stirring so that it gets a good coating of butter. Add a ladle of hot stock at a time and continue stirring until all the stock has been used. Meanwhile, steam the asparagus for 3-6 minutes or until tender to the point of a knife. Chop roughly once it is cooked. Add a knob of butter, the asparagus, half the parmesan and a good grinding of black pepper to the risotto and give it a stir. Serve your risotto in warm bowls with a sprinkling of Parmesan on top of each serving. 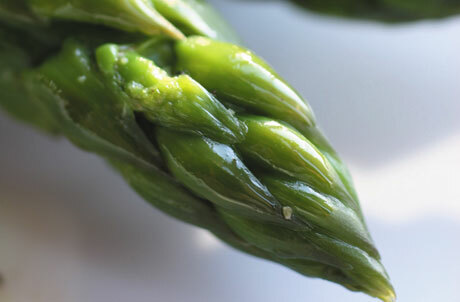 Bring a large pan of salted water to the boil and cook the asparagus for 3 minutes. Drain and refresh under cold water. Mix together all the ingredients for the dressing, and season with sea salt and black pepper. Place the broad beans, olives and half of the basil in a bowl and toss in 1 tbsp of the dressing. Arrange the asparagus and avocado on 4 serving plates. Sprinkle with the diced tomato and remaining basil leaves, and drizzle with the dressing. Serve with the broad bean salad on the side, and some hot, crusty bread.